The more I look around, the more I see people who are getting in to breeding Chesapeakes. I think this is great that Chesapeakes are becoming a more "popular" breed, but with it, I am seeing more and more fly by night breeders. Please consider buying from a breeder that has strong knowledge of the breed and the dogs pedigree and background. Buying a puppy from a breeder who is active in the breed generally doesn't cost too much more then buying from a breeder who is just in it "to breed." 1) How long have they been involved in the breed? Whiskey Creek acquired their first Chesapeake in 1996. I started showing conformation on and off until I had my first litter in 2001. I showed and finished my first bred by exhibitor dog in 2002. I have since been VERY active in competing in dog sports and activities ever since. 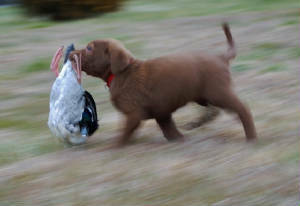 Whiskey Creek dogs are some of the most versatile titled Chesapeakes that are out showing and trialing competitively! 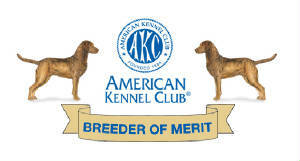 2) Are they a member of the breeds "parent club," The American Chesapeake Club, or any other dogs clubs? Whiskey Creek has been a member of the American Chesapeake Club since 1997. I am also a member of the Asheville Kennel Club and the Obedience Club of Asheville. 3) How many litters do they breed yearly? Because I would rather show and do performance activities with my dogs as to keep them bred, I generally produce one to two litters a year. Breeding takes a LOT of time if done PROPERLY! Yes, sure, it is easy to have a litter, keep them out in a pen and just let them "grow up" until they are 6-8 weeks of age and sell them off to the buyers. But we feel that when we have a litter it is our RESPONSIBILITY to make sure those puppies have had a firm and solid foundation of socialization and exposure to all types of situations. 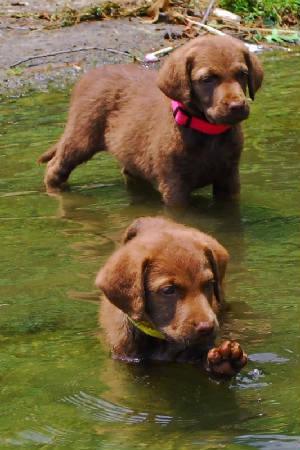 Buyers of Whiskey Creek puppies will confirm that our puppies are VERY well socialized, traveled (they are often found riding in my car starting at 5 weeks of age), and have had experiences that most breeders NEVER even think of exposing puppies to. 4) How many litters have their dogs and dams produced? Whiskey Creek FIRMLY believes that "less is more." Our girls are bred two to three times AT MOST. There is no reason to keep a female bred over and over again. Further more, Whiskey Creek NEVER does "Repeat Breedings." Two breedings of the same sire and dam RARELY produce the same "type" of puppies. Whiskey Creek feels like when a breeding is done it should be to "improve the breed." How can one "improve the breed" when there are 30-50 of the same pedigreed puppies running around? Isn't your dog more valuable if there are only 6-10 siblings with the same pedigree? "Less is more." 5) How do they select the sire and dam for their breedings? With all of these "new" breeding kennels popping up we are also seeing them have one or two "stud dogs" and a string of "breeding females." These breeders seem to use ONLY their own dogs to use on their own females. They often breed several litters of pups a year using the same females with the same dogs. 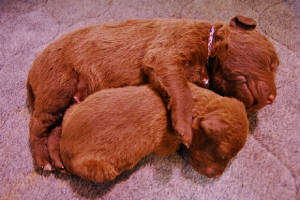 Little thought is considered as to how the pedigrees might "blend" or the conformation "faults" of the dogs being used. Breeding a dog and a female together "because they have nice puppies" is OK, but don't you want someone who can tell you WHY the puppies are going to be nice and what their breeding "goals" are when they select a particular sire and dam? Whiskey Creek researches pedigrees, conformation faults and positive points in the dogs and females used. When we breed a dog and a female together it is usually in the hopes to keep a puppy for ourselves to use as a show/performance/hunting dog. We have researched the puppies produced by the sires that we have chosen. We have also studied if any health issues have cropped up from certain breedings. We do not go out and pick a dog because he is "close by" or the neighbors dog, or pick a dog because we think he is "handsome." We pick dogs for what they will contribute to the breed. 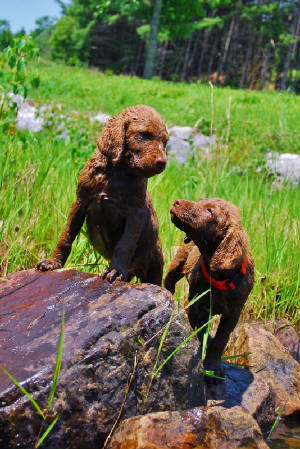 Whiskey Creeks goal is to produce a sound and even tempered dog that can do the job that the owner wants it to do, be it a family companion or a top notch hunting dog. 6) What activities are their dogs active in? Although the majority of pups sold from Whiskey Creek are going to "companion homes" or "pet homes" we want to make sure when we breed dogs that they "fit within the standard of the breed." 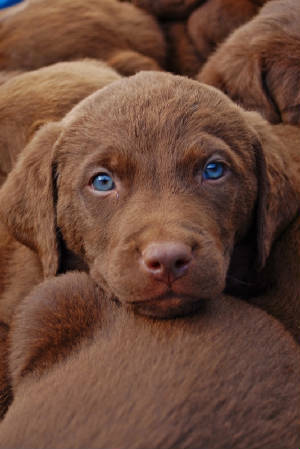 The American Chesapeake Club gave the American Kennel Club the standards on what a Chesapeake SHOULD look like, his behavior, his ability, and the breed in general. When a dog earns his Championship title it is saying that the dog "fits within the breed standard." When a dog is trialed in Rally, Obedience, Hunt Tests, Agility, and Field trials it proves that the dogs TEMPERAMENT falls within the breed standard. Not only does it say the dog can PERFORM it means the dog can handle PRESSURE. Dogs that are campaigned in ANY venue is a "special" dog. Go to a show, an agility trial, or a hunt test or field trial...these dogs are TRAINED to the highest levels. The average "pet dog" generally doesn't have the training or the behavior ability to handle going into situations like this. People who train their dogs to show in ANY venue have taken the time to take their dog to the "next level." Whiskey Creek dogs are active in a variety of activities. 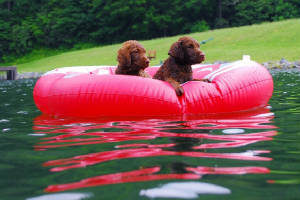 Conformation, agility, dock diving, obedience, rally obedience, and hunting. Puppies sold from Whiskey Creek can be found doing the same activities and of course, they are GREAT family companions and pets. 7) What health clearances do their dogs have? 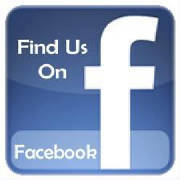 Whiskey Creek posts ALL health clearances on each dogs individual web page. All you need to do is click on the "Health Clearances" link under each individual dogs name on his or her own web page it it will open a new window to the Orthopedic Foundation For Animals. You will find hip and elbow clearances as well as eye (CERF) and genetic clearances listed for each animal and you can track their family history there as well! Whiskey Creek dogs do all required test to become a certified "CHIC" dog as well as many test that other breeders are not doing (cardiac and thyroid for example). On the OFA site you can also look up other peoples dogs. If the dog is not listed on the OFA site, then you need to ask the breeder of the pups what the status of the dogs are and LOOK IT UP! If it is not on the OFA website, the dog most likely has NOT had the test performed! (Note: some breeders do not pay the "extra" fee to have PRA or EIC results posted on the website...Whiskey Creek chooses to pay the added fee as to make finding and researching ALL health clearances easy for potential buyers. If the information is not posted, make sure to have the breeder give you proof the tests have been performed.) Most health issues with dogs can not been seen or detected by a simple vet visit. You can not see hip dysplasia...you have to x-ray for it and submit it to OFA or PennHIP for evaluation, you can not see eye issues without having a ophthalmologist examine your dog, and you can not see genetic conditions...you have to do a blood test for them. Just having someone say "my vet said he/she was healthy enough to breed" might not be a very good way to go about buying your new pet! ALL puppies are 'cute.' It is VERY easy to sell 'cute' puppies, but would you want to bring home any of the mature dogs that the breeder owns? Buyers need to think about the sire and dam of the litters they are considering buying a puppy from. Is the dam snarly and not very social towards strangers? 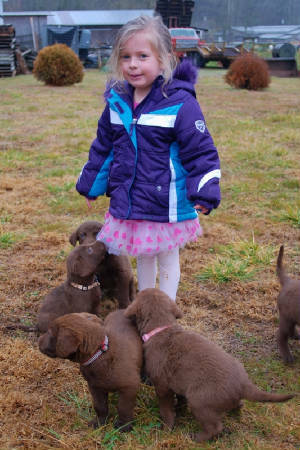 There is a HIGH LIKELIHOOD that pups from her are going to be the same way! 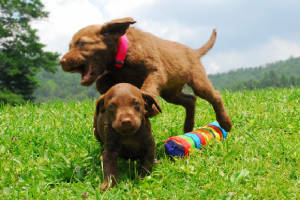 Don't think that you can 'change' your puppy's temperament 'easily.' No matter how much 'love' you give to your puppy, if it is 'wired' to be snarly, then it doesn't matter how much 'love' you give it- it is still going to be snarly! Don't fall into the trap of "...but I was 'rescuing' it from the breeder/seller/shelter/pet store. I just felt so bad for it..."
Buying a puppy like that only perpetuates those less than stellar breeders to continue to breed. Where there is a demand, they will supply! Puppies don't grow on trees! 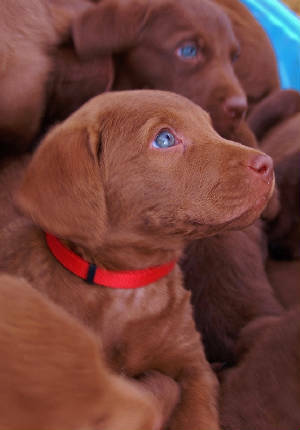 I often am contacted by a potential buyer who wants a puppy NOW. I don't breed many litters a year, so I don't often have puppies NOW. I also only breed when I know I have enough buyers to sell my puppies to. Yes, there is a good likelihood you will be waiting for MONTHS before I have a litter, but trust me, the wait will be well worth it! One buyer waited over a year and a half for a pup from one of my girls! Several litters were bred between the time he met me and he got his pup, but he wanted a pup specifically from Twiggy and was willing to wait for what he considered the perfect pup! If you are interested in a puppy from a particular female I have, contact me NOW as I probably have unadvertised plans in the making for the future of all of my girls and the potential breedings I hope to do with them. If you do not contact me, don't be disappointed when you learn you are 10th on the waiting list for a litter I hope to breed in the near future! Deposits are refundable, so planning ahead is a wise choice! The earlier you get on the waiting list, the higher the likelihood you will get a pup from the girl/boy of mine that you like!